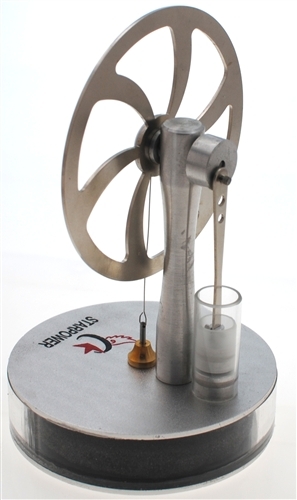 The Ultra Low Temp Stirling Engine will even run off the heat of your hand! Like toys that are hard to explain and amazing to watch? Like precision pieces of equipment that are beautifully engineered? Want a gift for the person that has everything? If so you will want a Stirling Engine. Originally conceived in 1816 by Robert Stirling, they are commonly known as external heat engines. These are the ultra low temperature versions of a Stirling engine that can run off hot water from a coffee cup, heat from a router, or your even hand. 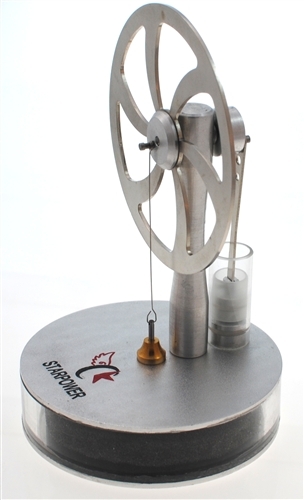 Stirling engines operate by using an external heat source rather than internal heat like a normal engine. The engines offered are fully assembled and not a kit. You will not find a precision Stirling Engine for a lower price. The easiest way to use them is get your normal cup of coffee in the morning, put the Stirling engine on top of the coffee cup, give it a slight push to get it going and as long as the bottom surface is hot compared to the top it will continue to run. The engine can be even run backwards by using ice instead of heat. These are precision pieces of equipment that are finally available at a economical price. We also offer a similar versions that do not run at such a low temperature differential than this one. Most other Stirling engines use a flame! FYI for your hand to be able to run the engine you do need to have warm hands and room does need to be cool. 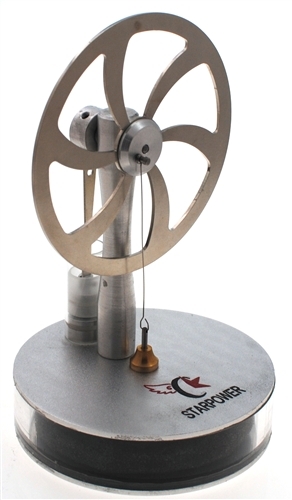 We offer a full line of Stirling engines, all units are tested before being sent out, and full phone support is offered. As added note you can even use this to identify if someone is a zombie or not. (Zombies being cold blooded will not be able to run the engine in the palm of there hand) is your friend a zombie or not? Ships from CA via USPS with a fixed shipping cost of $10.